In 1970/71 Ray Illingworth’s England went to Australia and regained the Ashes. Five captains, Gubby Allen, Walter Hammond, Freddie Brown, Ted Dexter and Mike Smith, had tried and failed since Douglas Jardine had last succeeded in doing so in 1932/33, and over that time only Len Hutton in 1954/55 had led England to a series win downunder. Not surprisingly in the circumstances England started the 1972 series as favourites to retain the urn, but everyone knew they were vulnerable. The side was an aging one and the county game, newly infatuated with one day cricket, was not producing very much in the way of new talent. In her only two series since returning with the Ashes England had lost at home to India for the first time in 1971, and while Pakistan had been beaten earlier that summer England’s display against them was far from convincing. Australia, who had not had any Test cricket in 1971/72 due to the cancellation of the South African tour that had been due to take place, had instead played a series of matches against a touring Rest of the World XI. The visitors were not as strong as the team with the same name name that had played a series of five “Tests” in England in 1970, but were still a powerful side. The Australians went one up by winning the second of the five match series but after that the brothers Pollock joined the Rest’s side and they took the series by winning two of the remaining three matches. For Australia the Ian Chappell era had begun when he was appointed to take over from Bill Lawry in the final Test of the the 70/71 series, although it had been a losing start. Inevitably there was new blood in the Australian side for 1972 but the core remained the same, nine of those who appeared in the 1972 series having played a part in the previous one. For England despite his travails of the previous summer, and the fact that he turned 40 during the series, the wily Illingworth remained captain of a side that, over the course of the series, saw eleven names from the previous tour selected. Fortunes fluctuated throughout an entertaining series which was eventually drawn 2-2 after Australia won a superb final Test at the Oval thanks, initially, to a stand of 201 in their first innings between the Chappell brothers. On the final day, just as it seemed England would run out victors, an unbeaten partnership of 71 between Paul Sheahan and Rod Marsh saw Australia home by five wickets. There were few new names who excelled in the series. For England there was just just one, future captain Tony Greig, who topped the batting averages and also took a few wickets. For Australia Ross Edwards did well with the bat, averaging 48 despite being dismissed for a pair in the fourth Test when he was tried in Australia’s attempt, at no point successful, to find an opening partner for Keith Stackpole. Back home in 70/71 Australia’s real problem had been with her opening bowlers. No fewer than six had been tried of whom only one, Dennis Lillee, made the trip to England. Lillee took 31 wickets at 17 in 1972. His opening partner of choice was the man whose career this feature concentrates on, Bob Massie, who took 23 at virtually at the same cost. Massie was born in Perth in 1947 and was a right arm quick bowler. He was nothing like as fast as Lillee, and not even a true fast-medium, but pace was not his primary weapon. He was a swing bowler and, in the words of Dennis Lillee ..on his day Bob Massie was the best swing bowler I saw. The early signs were not, however, particularly promising for Massie. He was selected to play for Western Australia at just 18 in 1965 but, failing to take even a single wicket on debut, it was to be four years before the state called him up again. In 1969/70 and 1970/71 there were several opportunities for him to show what he could do when Garth McKenzie and, later, Lillee, were playing for Australia. His figures on those occasions were not spectacular (he was destined never to get a five wicket haul for Western Australia), but he was never collared and took enough wickets at a low enough cost to ensure that by 1971/72, and the turning of the selectors thoughts to the Ashes, he was taken seriously by the men tasked with rejuvenating Australia’s new ball attack. Selected for the third match against the Rest of the World Massie did just enough in that game, which Australia lost due mainly to one of Gary Sobers’ great innings, to hold his place for the fourth match. As soon as he got the ball in his hand at the Sydney Cricket Ground Massie made a sensational start . The Rest began their first innings late on the first day and he removed opener Hylton Ackerman before the close. Next morning, reducing his pace to take advantage of favourable swing bowling conditions, he took out nightwatchman Asif Masood and then Zaheer Abbas before conceding a run. Sunil Gavaskar fell to him with the Rest’s score on just 21 and when Graeme Pollock and Sobers were dismissed to make the score 68-6 Massie had all six. He came back at the end to take the last wicket and end up with figures of 7-76 in a bowling display which he always considered to be the best of his career. After his displays against the Rest of the World Massie’s place in the 1972 party was assured. His style of bowling was always going to be suited to English conditions but he certainly knew what to expect. He had spent three happy summers in Scotland playing league cricket and knew all about wickets that were soft, low and slow and he was no stranger to bowling in cold, damp and cloudy conditions. England would not however have been unduly concerned. Massie did have a brief trial with Northamptonshire in 1970. A return of 3-166 in two second eleven matches did not suggest that a world beater had been unearthed. The traditional tour opener at Worcester saw Massie announce himself emphatically as he took 6-31 in the county’s second innings, including a spell of four wickets in the course of seven consecutive maidens. The impact of that performance was, however, quickly dissipated as he took just one wicket in his second game and then had to leave the field with a side strain in his next match which ruled him out of contention for a place in the side for the first Test at Old Trafford. The match was a low scoring encounter which England won by 89 runs. Had it not been for a brave ninth wicket stand in the Australian second innings between Marsh and mystery spinner Johnny Gleeson of 104 the home side’e margin of victory would have been much greater. There were two more games before the second Test and Massie played in both, taking a few wickets but not coming close to threatening the carnage he had orchestrated at Worcester, and was to revel in again at Lord’s on his Test debut. The weather in London on Thursday 22 June 1972 was overcast and light rain meant play started half an hour late. Initially Geoff Boycott and John Edrich appeared to have the measure of Lillee’s pace and Massie’s swing but from 22-0 England slumped to 28-3. The first dismissal was a memorable start for Massie as Boycott played over an inswinging yorker that bowled him neck and crop. Lillee then beat Edrich and Brian Luckhurst for pace to claim the only wickets in the innings that would not fall to Massie, who ended the day with 5-75 from England’s 249-7. It could have been worse for England who at one stage were 97-5, and then 200-7 but, lacking a Test class third seamer, and with Lillee and Massie exhausted after bowling almost fifty overs between them, Chappell could not execute the coup de grace. Next morning Massie took the last three England wickets as the home side added 23 more runs and by the end of the day Australia were 71 runs behind, having reached 201-5. England had removed both their openers with just seven on the board, but with their specialist swing bowler, Geoff Arnold, pulling out on the eve of the match with a hamstring strain, they had no one who could begin to replicate the movement that Massie had found, and a fine unbeaten century from Greg Chappell was the cornerstone of the innings. In 1968 I had been too young to take very much notice of the previous home Ashes series and for some long forgotten reason I had not been able to watch the play on the Saturday of the Old Trafford Test. Sunday was a rest day in England in 1972 so Massie’s Saturday was the first opportunity I had ever had to watch a day’s Ashes cricket. It was as bad a day at the office for England as I have ever seen, although disappointment was tempered by being able to watch Massie swinging the ball prodigiously in both directions. It didn’t start too well. I had expected John Snow to wrap up the Australian innings pretty quickly but that wasn’t to be. Chappell carried on for a while in his elegant way and, rather less stylish but just as effective, Rod Marsh scored a belligerent 50. In the end Australia had a lead of 36, but I was confident England, with my new favourite Tony Greig and old favourite John Edrich, would reassert their authority. By the end of the day England were 86-9 and the match was all but lost. Lillee had started the collapse as he ripped out Boycott and Luckhurst, the former somewhat unfortunate as a harmless short delivery that struck his body rolled agonisingly onto his stumps. As for Luckhurst Lillee was just too quick for him, as he was for Edrich although it was Massie who claimed his wicket, as he did with the other six, and for good measure he got the last one one on Monday morning, but I was back at school by then, and not terribly interested in the news that came through during afternoon break that Australia had completed a nine wicket victory. Massie had bowled unchanged through the entire second innings and had 8-53 and match figures of 16-137. In the history of the International game only Jim Laker and Sydney Barnes had taken more. And on debut too – seldom has the word remarkable been uttered so often. The third Test was the solitary draw, which England achieved with surprising comfort in the end. The 451 needed for victory in nine and half hours was never going to be attempted but few expected England to move comfortably, as they did, to 290-4. Massie had a good spell in the first innings and had match figures of 5-92 which included his candidate for “ball of the century”. Edrich was the unfortunate batsman in England’s second innings. Massie, bowling round the wicket, bowled down the leg side and a wide looked the likely outcome. The entire ground, and particularly Edrich, were astonished to see the ball jag in late to bowl the Surrey opener. The fourth Test at Headingley was England’s, comfortably, by 9 wickets. The wicket was slow and took turn and drew Lillee’s sting and was a useless strip of turf for Massie, who failed to take a wicket and indeed bowled only 14 of the 120 overs that took up England’s first innings. As noted Australia squared the series at the Oval. Again England had a slow wicket to work with that did not favour Lillee and Massie but the former bowled quite superbly to claim five wickets in each innings and while Massie had only two scalps to show for his efforts, he stuck manfully to his task in unhelpful conditions. It is often said, not without some merit, that Massie was fortunate to take as many wickets as he did at Lord’s albeit only on the basis that Lillee bowled just as well and could easily have ended up with more scalps than he got. I recall that Lillee did indeed bowl beautifully on the Saturday, no English batsman looking in the least bit comfortable against him or likely to score many runs. But Lillee didn’t look like he was going to take a wicket with every single delivery – Massie, on the other hand, most certainly did. His bowling at Lord’s was as near perfection as I have ever seen were the words Lillee wrote in 2003. Reflecting on the series in 1976 Ian Chappell said of Massie The Englishmen had gone into near panic trying to work out how he swung the ball. Marsh later wrote I think he enjoyed bowling when it was cool, and that’s how it was at Lord’s.He gave a freak performance, probably something I’ll never see again. The ball really swung and Bob was the master of control and accuracy at all times. It helped Massie also that he was, at this point in his career, able to bowl either an outswinger or inswinger at will without any readily discernable change of action. He also spent a good deal of his time at Lord’s bowling round the wicket, where the notorious ridge helped to exaggerate his already prodigious movement. What did the England players think? The views, for once measured, of Tony Greig are illuminating. Greig had been in the Rest Of the World XI in Australia and noted that even Garry Sobers was unable to pick Massie’s inswinger from his outswinger, and that the great man was constantly troubled by Massie, who twice dismissed him cheaply in the series. Of the Lord’s match Greig wrote in 1980 By taking sixteen wickets in the match and bending the ball fantastically, he convinced me that he is the finest exponent of medium-paced swing bowling I’ve ever faced. Also in 1980 Basil D’Oliveira wrote I’ve never seen a man swing the ball so much … none of us could master him. But it wasn’t all praise from England. Alan Knott wrote later I remember that at he end of an over skipper Ian Chappell used to take the ball from slip, pass his fingers across his face and then wipe the ball, before handing it back to Massie as he was preparing to bowl. This was a theme that D’Oliveira picked up on and he went on to say that before the fourth Test he, Illingworth and Peter Parfitt experimented in the nets with D’Oliveira, no mean swing bowler himself, using grease on a ball. Parfitt apparently gave up batting in the end so unequal was the struggle. Illingworth was, according to D’Oliveira, satisfied in his own mind that all was not well with Massie but, his effectiveness already on the wane, decided not to pursue the matter any further. Did the Australians apply a foreign substance to the ball? I suppose it must be possible, Knott and D’Oliveira were nobody’s fools, but the last words I will quote on this issue are Tony Greig’s. Not normally of course a man to hold back Greig’s conclusion was that the allegations were …groundless and degrading…. There were, according to D’Oliveira, other reasons why Massie’s effectiveness declined so markedly after Lord’s, the main one of which being that after studying recordings of Massie’s bowling at Headquarters the England batsmen finally worked out that there was a slight change in action between the outswinger and inswinger which enabled them to pick him. The batsmen also started to adopt the tactic of standing well outside their crease in an effort to force him to shorten his length, and thus give the ball less opportunity to swing. Given Massie’s comparative lack of pace I don’t suppose the likes of Don Tallon or Wally Grout from previous generations would have permitted that, but I don’t recall any point at which old irongloves decided to stand up to the stumps. 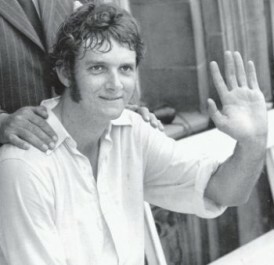 In 1973 Massie, along with Lillee, Stackpole and Greg Chappell were chosen as four of Wisden’s five cricketers of the year. There were prescient words in the piece about Massie Success, in fact, has come very quickly for Bob Massie, and it would be unwise, apart from applauding, to pay too much attention to his one sensational performance in that Lord’s Test. Australia’s next series was against Pakistan in the 1972/73 season and Massie was, of course, selected for the first Test which Australia won by an innings. It was business as usual in the visitors’ first innings as Massie took four wickets as Pakistan were reduced to 104-6. The spinners finished the job in the second innings and Massie was called upon to bowl only nine overs then. Massie was rested for the second Test the selectors bringing into the side the man who would take over his role, Max Walker, as well as the mercurial Jeff Thomson. This is the occasion when Thomson neglected to mention to the selectors that he had a broken foot. He didn’t take any wickets and was promptly dropped to make way for Massie’s return. Thommo’s day, as all England was to learn, was still a couple of years away. For Massie that third and final Test against Pakistan was the last he would play. He had a match-winning role as well although, surprisingly, that was nothing to do with the four wickets that he took in the match. The 42 that Massie scored in the Australian second innings was comfortably the top score in that innings and of his career. Had he not put on 83 for the ninth wicket with leg spinner John Watkins, who was making his only Test appearance, then Australia would certainly have lost the match. Following the Pakistan series Australia flew to the Caribbean for a full five Test series. Massie was selected for the party but his form was wretched at the start of the tour and he then had a bout of flu. In the match against Guyana between the third and fourth Tests he showed what he was capable of by, following a wicketless first innings, taking a matchwinning 7-52 in the home side’s second effort, but by then the Test side was settled and Massie played no part in a series won 2-0 by Australia. The pace bowling places, following Lillee’s early breakdown, were entrusted to Walker and Jeff Hammond. By now Massie’s First Class career was rapidly drawing to a close and all that remained were four unsuccessful Sheffield Shield games in 1973/74, and one last one the following season. Bob Massie’s career as a First Class cricketer was over at just 27. There was no injury to explain the loss of form – he had simply lost whatever it was that set him apart and had never found it again. So despite his magical achievement at Lord’s Bob Massie never carved out a Test career for himself, or was it because of it? Stackpole wrote I have wondered since whether Massie’s spectacular performance at Lords proved to be his undoing. The Poms began to study him and change their methods, and, maybe because success had come so easily, he got a bit lax. Never one for working hard or watching his diet, he was to lose fitness and form the following year. Former Western Australia all-rounder turned journalist Ian Brayshaw was a little kinder in 1982 writing of Massie He suddenly lost form and simply could not recapture it. I thought at the time that he may have lost it because he became too obsessed with disguising his deliveries to the point of perfection and when it came to working in the nets to regain form, he had simply had too much cricket. His appetite had gone. His cricket career over, Massie went back to his career in banking and in the fullness of time he became a radio commentator as well. His place in the history of the game is guaranteed but, remarkably in my view, his seemingly unbeatable record for having the best ever figures by a Test debutant has been taken from him. In January 1988 leg spinner Narendra Hirwani was called up by India for the fourth and final Test of their home series against West Indies. India were 1-0 down going into the match but the selectors’ gamble paid off in spectacular fashion. India squared the series with a crushing 255 run victory. Hirwani’s match figures were 16-136, just a single run better than Massie’s record. It would have been fitting if they had shared the record – although Hirwani’s Test career lasted nearly a decade, and his first full series the following year against New Zealand yielded him 20 wickets at 19.50, like Massie he never fufilled his early promise and appeared in only 17 Tests.